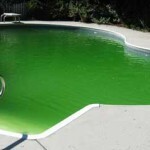 Green swimming pool and algae problems. Do you have a green pool or is it starting to form algae? The most common reasons for a green pool or algae to form are listed below and also the ways to resolve them. Low chlorine level or other form of sanitizer. If the chlorine level is low this can cause for algae to bloom. Ensure it’s kept at the correct level between 1-3ppm for pools and raised to 10ppm when shocking the pool. It depends on the size of the pool as to how much sanitizer needs to be added. Ensue to read the directions on the chemicals for dosages. High total dissolved solids (TDS) can cause algae bloom issues. The only way to lower the TDS is to fully or partially drain the pool or some other form of water replacement. High phosphate levels. Phosphates are like food to algae. Test for phosphates and treat as needed with phosphate remover. In correct cyanuric acid levels (CYA) can cause chlorine not to be as affective. Too low the chlorine will dissipate quickly too high and it will not be affective and you’ll start to see purple areas forming. Ideal level is 30-100ppm. There are now some chemicals that can be used to lower the CYA or water replacement is needed. Lack of filtration. This can be caused by the pump not running long enough or fast enough. Lack of water flow due to either a blockage or some other reason as well as dirty or poor condition filters. As a rule of thumb it’s suggested to run the pump for an hour per each 10″ in temperature. Clean filters as needed when the pressure rises or suction decreases and replace as needed. Lack of algaecide. There are various forms of algaecides ensure your pool is treated with it and continued maintenance dosages added as needed. If your pool has gone completely green there are chemical treatments that can be used to clear it. Test the water chemistry prior to adding anything as if the cyanuric acid or TDS levels are too high it may not be affective and a pool drain or water replacement might be needed. If you have any questions feel free to contact PoolStar the Henderson swimming pool cleaning service. This entry was tagged green to clean, green pool, green swimming pool las vegas, Henderson green swimming pool, green swimming pool. Bookmark the permalink.